Wanton vandalism: The site at Pierces Creek where regenerating bush has been flattened by a 4WD. Photos: ACT Parks and Conservation. 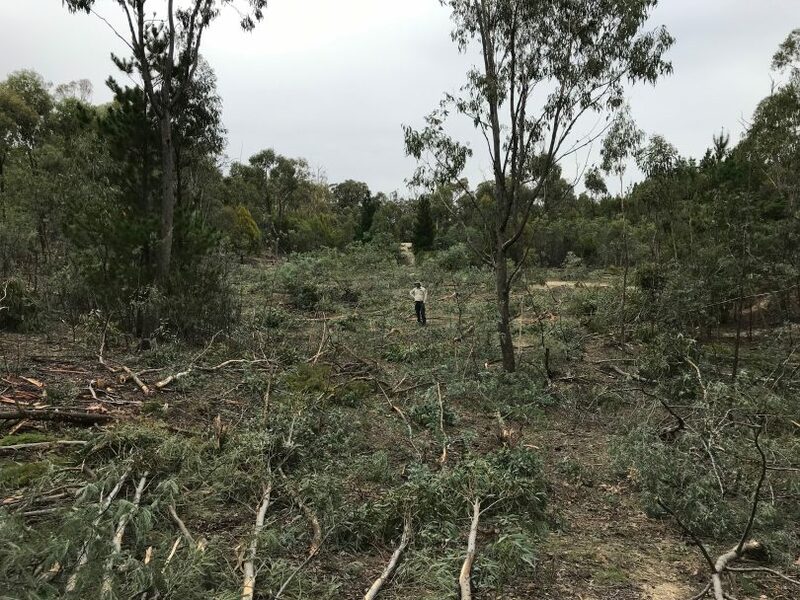 Fifteen years of regeneration in the Lower Cotter Catchment has been flattened by a four-wheel drive vehicle in one of the worst acts of wanton vandalism ACT Parks and Conservation has ever seen. The area was devastated in the 2003 bushfires but has been regenerating with extensive tree planting but this half hectare site off Laurel Camp Road in Pierces Creek forest now looks like a cyclone has ripped through it. 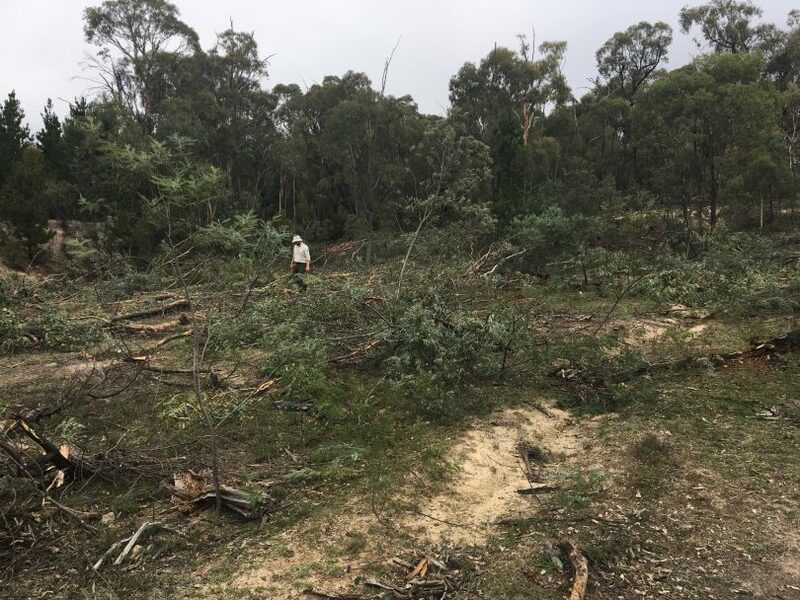 ACT Policing is now investigating the vandalism in which regenerating native trees and shrubs were deliberately and methodically driven over, giving rangers the impression the offender was trying to clear the site. ACT Parks rangers came across the damage at about 2 pm on Saturday 23 March and the vandalism is thought to have occurred last Friday and Saturday morning. A Parks spokesperson said the site would be protected from further 4WD activity using rocks and logs to ensure the native vegetation and species were able to recover. The maximum penalty for damaging a native tree (over two metres high) on unleased land is a $64,000. In addition to the penalty, a court may also make an order for the responsible person to pay the Territory the cost of making good the damage. As well as police investigating, Parks has posted images on Facebook and calling for anyone with any information to contact the agency or contact Crime Stoppers anonymously at https://act.crimestoppers.com.au/. 4WD eh? So you will be looking for someone with a kid in Pre-School. Maybe if they unlocked all the tracks people wouldn’t feel the need to make their own to get places they have been going for years. Creeps. Feral little no nothing cretins. Lets say there is a conservative 100 damaged trees in that location, then the extent of the penalty is in the vicinity of 6.4 million. Surely thats enough impetus to get the plod to do a little more than put out a call on facebook isn’t it ? Bring the guy in, throw the book at him, and put traffic cameras on the entrances to the cotter. Said it before, I’ll keep saying it again. How much damage is it going to take ? Same with the bikie’s shooting up the streets, torching cars and biffing in shopping centres, it appears nothing will move until an innocent bystander/neighbour is injured or killed. One can only hope the grub who did that damage also managed to rip out his sump or diff. Sadly there are a small number of d@#kheads in this world that wreck it and jeopardise it for those who love, respect and want our beautiful surroundings. People who genuinely enjoy the bush and the camping lifestyle are truly appalled with this sort of idiotic behaviour! Hang them up in public and let us all tar & feather them !! Name & shame I say !!!! Having said that though, they do seem like some decent sort of thickness trees for a bull bar to be pushing over successfully! Just not acceptable on any level. True 4X4 enthusiasts are appalled by this sort of behaviour. The culprits should be found and their licences to drive anything should be taken off them and then the should be forced through community orders to plant a 100 trees each at least as part of their social rehabilitation. So terrible, isn’t this the area that had bush fires a while ago? Why do this! So stupid! That’s more damage than horses would ever do! This is why no one can have nice things. Because there’s always some clown who ruins it for the ones who don’t abuse the privilege. Tommy Metcalfe why punish the ones who do the right thing? That's unfair. Catch the mongrels responsible and punish them. wrong Tommy. Why ban all 4wd activity in areas because of some scum sucking lowlife. You will find 99% of 4wd persons have respect and treat the bush better than some one who has never been out there or have done any type of 4wd or camping. So don't take the attitude of banning all, it is very wrong and very biased. I hope you catch the grub😡 throw the book at them! Someone knows who it is and they should dob them in!!!!!!! This just makes me sad....cant understand why anyone would do this. Daniel Palmer unfortunately so have I.
Belinda Konz someone with entitlement issues. Clearly. Daniel Palmer unfair to muppets. Lyndsey Ebdon my small body part applies to both sexes - have seen stupid behaviour from females in 4wds too!